Leicester City honoured owner Vichai Srivaddhanaprabha with a victory as they beat Cardiff City 1-0 on an emotion-filled day at the Cardiff City Stadium, writes Sky Sports. There were tears and tributes ahead of kick-off to remember Srivaddhanaprabha and the four other people who were killed in a helicopter crash last weekend. Victor Camarasa hit the bar for the visitors with a free-kick in the first half before Cardiff defender Sol Bamba escaped a red card for a goal-line save with his arm. Leicester grew into the game and Demarai Gray scored the winner in the 55th minute, finishing from Ben Chilwell's cross and then taking off his shirt to reveal a top with the words 'For Khun Vichai' written across the front. Cardiff were unable to rally and there were moving scenes after the final whistle as Leicester players, most of whom are travelling to Thailand after the match for Srivaddhanaprabha's funeral, stood in front of the away supporters and applauded for 10 minutes. Some fans held up messages, while others struggled to hold back their emotions. Leicester manager Claude Puel had said ahead of the match he wanted to find a "good balance between emotion and concentration", but it was emotion that ruled ahead of kick-off. Players and supporters wore T-shirts honouring Srivaddhanaprabha and Cardiff fans passed a Thai flag with the crests of both clubs into the away end before an impeccably-observed minute's silence. All of the Leicester players and staff stood on the centre circle for the minute's silence, with goalkeeper Kasper Schmeichel appearing emotional and there were tears among the away supporters. Considering the events off the pitch, it was little surprise that the first half was largely low key. Camarasa hit the bar with a free-kick in the 31st minute, shortly after Harry Maguire had gone off with an injury. Leicester improved as the half wore on and Wilfred Ndidi headed wide from a corner in the 37th minute. However, the biggest talking point came in injury-time when Jamie Vardy's shot was tipped onto the bar by Bamba's outstretched arm. Referee Lee Probert, whose view appeared to be blocked, waved away Leicester's strenuous appeals for a penalty. But the Foxes did take the lead after the break when Chilwell crossed for Gray to finish from close to the penalty spot. Gray was booked for his tribute to Srivaddhanaprabha, but only after impassioned celebrations from the Leicester players in front of their supporters. Cardiff have enjoyed just one win in their last 15 Premier League games, drawing three and losing 11. Leicester are the only side to score in each of their Premier League games this season (11 games). Cardiff have failed to score in six Premier League games this season, a joint-divisional high along with Huddersfield and Southampton. Leicester have won seven of their last nine Premier League games against promoted sides (D1 L1). Leicester have won three of their last five Premier League away games (L2), as many victories as they had managed in their previous 12 on the road in the competition (D1 L8). Demarai Gray has registered goal involvements in consecutive Premier League for only the second time ever (scoring v Cardiff and assisting v West Ham), and the first time since December 2017. 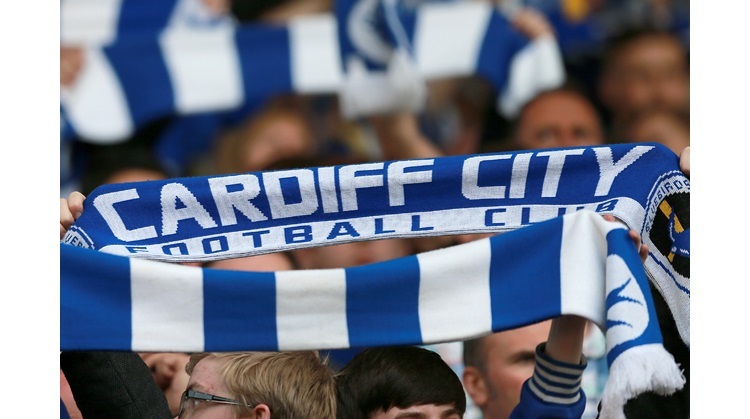 Cardiff: Etheridge; Manga, Morrison, Bamba, Bennett; Arter, Gunnarsson, Camarasa; Decordova-Reid, Murphy, Paterson. Not used: Smithies, Cunningham, Damour, K.Harris. Leicester: Schmeichel; Pereira, Morgan, Maguire (Evans, 27), Chilwell; Ndidi, Mendy; Gray (Simpson, 70), Maddison (Iborra, 83), Albrighton, Vardy.